Canmore, Alberta offers up some of the best mountain biking in the Canadian Rockies. Sitting right on the borders of Banff National Park and Kananaskis Country, Canmore offers up great trails with excellent views of some of the Rockies most impressive mountains, beautiful rivers, waterfalls and lots of wildlife viewing. 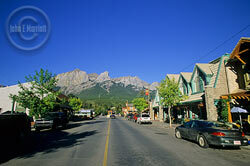 Canmore is a great place for mountain biking on your Rockies vacation. Afterward, the quaint town of Canmore offers terrific hotels, restaurants and bars to regale you at the end of a long day on the bikes, as well as other Rockies adventure vacation activities including rafting, hiking and heli-tours. Below you’ll find a selection of Jasper mountain bike trails. To see Jasper, live, check out the Jasper webcam. Also, you may want to visit this Rockies biking blog. Distance: 9.5 km return. Elevation gain: 200 metres. Time: 3 1/2 hours return. Location: From Canmore, drive 39 km south on the Smith-Dorrien / Spray Trail (Highway 742 – gravel road) which begins just past the Canmore Nordic Gentre. Turn right 5 km. to the Mount Shark parking lot, where you will find the trailhead. Directions: From Canmore, drive 39 km south on the Smith-Dorrien / Spray Trail (Highway 742 – gravel road) which begins just past the Canmore Nordic Gentre. Turn right 5 km. to the Mount Shark parking lot, where you will find the trailhead. Distance: 18 km to Banff. Elevation gain: Minus 300 metres. Time: 3 hours one way. Directions: From Canmore, drive 9 km south on the Smith-Dorrien / Spray Trail (Highway 742 – gravel road) which begins just past the Canmore Nordic Gentre. Turn right into the parking lot, where you will find the trailhead. Distance: Over 60 km of trails. Location: From Canmore, follow the signs from downtown. Ride open trails only. Respect the trail and avoid areas which are closed to bikes. They are closed for a reason. Seriously, no one is trying to hide trails from you just to ruin your vacation. Also, remember that the way you ride will influence Parks Canada trail management decisions and policies. Always yield the trail. Make your approach known well in advance. A greeting, a bell or some other noise is basic politeness; don’t startle others. Show respect when passing by, slowing to a walking pace or, if need be, stopping. Anticipate trail users around corners and in blind spots. Put a lid on it! Always wear a helmet. Plan it, darn it! Know your equipment, be honest about your abilities, and check up on the riding trail, preferably with a park ranger. Prepare accordingly. A little planning is often the difference between a horrible day and an awesome day. Stay in Control. Don’t go faster, or attempt terrain that you know you can’t handle. Always be attentive and mind bicycle regulations and recommendations. Leave no trace. It’s everyone’s park, so treat it with respect by following a few simple rules. Stay on maintained trails and don’t create new ones. Pack out what you pack in, and bonus points if you pack out some other jerk’s discarded rubbish. Don’t scare the wildlife. You don’t like it when someone sneaks up on you, and neither do wild animals. Usually, the repercussions of doing this with a bear are worse though. Avoid unannounced approaches, a sudden movements, or a loud a noises. These actions can be dangerous for you, others, and wildlife. Give wildlife space and time to adjust to you, and make some noise as you come down the trail.